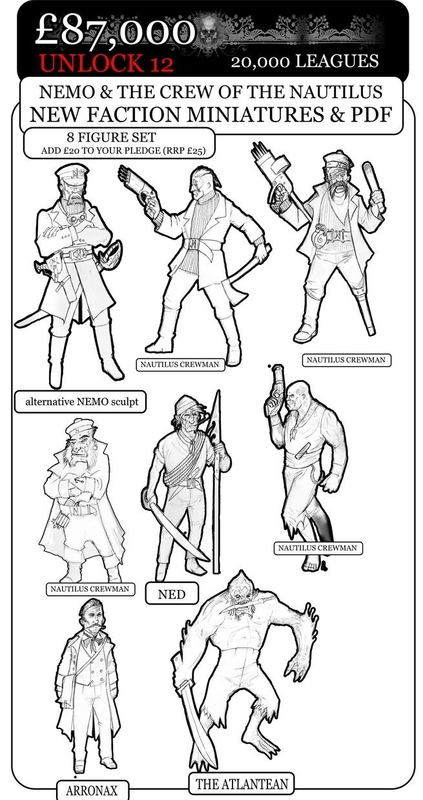 One of the bigger surprises in the last couple of days of the Empire of the Dead: Requiem Kickstarter project was the appearence of a new faction – Captain Nemo and his crew, with an alternative Captain Nemo sculpt to the one available in the Requiem range of minis. The new captain Nemo much more like the one portrayed on the big screen by James Mason or Robert Ryan. Of course, anyone knows that a good crew needs a ship, but where to find one? Well, the solution could be this model from the Honourable Lead Boiler Suit Company. I first saw this waterline 28mm scale model of the Nautilus at Partisan a couple of years ago, and it is, indeed, gorgeous. 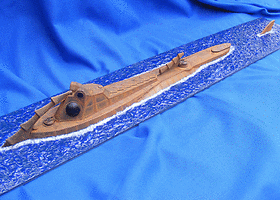 The main hull is 610mm long, and the end of the tail fin, if built to scale, should make the final model 760mm long. At £75, it’s not a paticularly cheap model, but it is a thing of beauty, and what any self-respecting Victorian Steampunk ship Captain would like to be sailing. You can find this kit for sale on the HLBS Co website. That reminds me i must watch “20,000 Leagues Under the Sea” again. Pegasus Hobbies have a Nautilus kit coming out though I am not sure what scale or size it is. After a few years of vapour ware it has finally been sighted at the Nuremberg toy fair. Italeri have a 1/35th X-craft coming out and Revell do some big 1/72nd submarine kits that might be an expensive alternative, and I would not like to waterline one. Real submarines look a bit boring compared with the Nautilus though it might be interesting to go back to the book description rather than the Disney version. Another alternative is to take a ship kit, full hull of course, and turn it upside down. You would probably need to thin it down and probably alter the stern but it should work. The old Airfix Bismarck springs to mind but anything fairly cheap around 1/600th should be perfect.